This year for the first time, I have 2 plots in the community garden next door to my building (we have no sun in our yard, so I was limited to a couple of window boxes on the back porch). They've only had veggie plots for a couple of years, and there are only 4 of them, but oddly enough they had no takers, so I got 2. I haven't ever grown anything beyond a some potted herbs, plus the cherry tomatoes in window boxes last year, so this will be a big adventure. And more than slightly insane. Microgreens (a braising mix and a spicy Italian mix) - these have been very gratifying so far! They had sprouted within a few days. Woohoo! Replaced the cucumbers the rabbits ate and secured a chicken wire fence. Looks terrible but hopefully it will do the trick. On a whim, I planted potatoes. Found a bag of forgotten potatoes in my garage that sprouted eyes. I cut them into quarters-eye side up- and planted them in an area of the garden where there is nothing planted. It gets east and south exposure but no west exposure as the area is a bit shady in the afternoon. It took only less than a half an hour from start to finish. Have no clue if this will work. The key to potatoes is to keep adding soil as they grow--you'll get a better yield that way. Pretty sure just mounding it up will work. Which reminds me, I new to go get some more veggie bacto tomorrow since all of mine somehow sprouted even with the horrific conditions this weekend. Thanks for the info-the dirt in the area where I planted the taters is a bit sparse. Will add some dirt and compost. Found some interesting plants for sale at Jong Boo yesterday... got four shishito pepper plants for $3. They also had some kind of Korean squash and a couple of other types of peppers. If I had more room in the raised bed, I would have tried some Korean hots. It's been chilly here - in the 50s and 60s the past few days. The radishes, snow peas, and microgreens are coming along nicely, the beets reasonably well, and the carrots seem to be slow and spotty (and one of the 3 varieties, Atomic Red, doesn't seem to have germinated at all). The broccoli and the 2nd round of melons are just starting to sprout (I only planted them and the microgreens a couple of weeks ago). However, the various tomatoes and peppers and basil that I direct-sowed (after the first round that I had started inside mostly didn't survive transplanting - I think they got dried out) are doing jack-squat. Is it because it's been so chilly, and I should just be more patient? At what point should I decide that they just aren't going to germinate, and plant something else there? My new batch of seeds arrived today (more broccoli, broccoli rabe, kale, cauliflower, romanesco, cucumbers, mixed summer squashes, cabbages, and eggplants) and I am trying to decide what to plant now, and what to save for later in the summer after, say, the radishes or some of the greens or the initial round of broccoli have petered out. And I need to figure out where to plant whatever new stuff I decide to plant now - maybe the cucumbers in the row where only a couple of the Armenian cucumbers survived? The squashes and/or eggplants in a row on the other side of where the melons are starting to sprout, on the theory that I will have to build some kind of trellis in between the two rows? Any trellising tips, or am I just going to have to wing it? In my opinion, there is no way that direct seeded tomatoes, peppers, eggplant, etc. will grow in our climate. I'd look for plants--good-sized ones at this point. I would also recommend a trip over to the Peterson Garden Project website-they have a lot of "garden minute" you tube videos that address these types of questions and you can post questions I think. Seems like you have enough stuff to start your own 10 acre farm--that's a lot of different varieties (and bugs and soil conditions and fertilization needs and seedling thinning and watering) to worry about. And carrots are notoriously slow growing. And broccoli and cabbage attract bugs that may mow down everything but the metal tomato cages (slight exaggeration but not by much). It's easy to get overwhelmed but there are lots of resources out there--maybe more active than those here that could be helpful. I just encourage you to maybe scale back just a bit to get a feel for this type of gardening if you haven't done it before. Well, a) I kind of figured that not everything would work and b) I have a good friend who lives nearby who has a huge double lot and three hungry teenagers who will happily take any plants I need to thin out Last year I had great luck growing cherry tomatoes in a couple of window boxes on my back porch, and had to thin them out so many times that I was bringing in seedlings to give away at work! This year I have 2 plots in the community garden next to my house, where there is actually sun (unlike in my own yard, which is shaded by a huge tree). Thus the window boxes on the back porch - it was the only place that got any sun. And I knew this was going to be a learning experience. I'm not stressing about it, just fantasizing about yummy tomatoes. With 120# garden soil, 75# cow manure, spread evenly. 6' x 12' space in full sun. I stake the tomatoes and tie them with twine as they grow, adding more stakes to make a 'cage' of sorts. About 18" right now. Update time. Yes it's been cold and rainy but doesn't seem to be slowing anything down out here! Last edited by boudreaulicious on June 12th, 2015, 6:25 pm, edited 1 time in total. Update: my radishes and various braising/salad greens are going insane! The beets are coming along nicely, as are the peas - we put up one trellis last week, but ran out of sunlight to do the one for the other bed (for the eggplants and melons). But those aren't growing quite so fast, so the trellis isn't so urgent yet. The peas are already about 18" tall and were starting to tip over. Meanwhile the various kinds of broccoli and romanesco and cauliflower that I planted last weekend are sprouting like mad, as are the mixed summer squashes and Lebanese cucumbers. I think I will save the broccoli rabe and kale seeds for later in the summer, after the radishes and spring greens have petered out. I also planted a basil plant, a mint plant, and some dill. I am looking forward to some awesome mojitos this summer, as well as my favorite Azerbaijani grilled lamb recipe (the marinade is pomegranate juice, lots of garlic, salt, black pepper, and mint). I think the broccoli and squashes, especially, will need to be thinned out once they get a bit bigger, but one of my co-workers just got her raised beds up last week and has volunteered to take extra veggie seedlings. The tomatoes do seem to be sprouting, but no peppers yet. Ah well, if the peppers don't come up, I can always move some overcrowded broccoli or something where the peppers were going to be. Not to second-guess you, but the growing season in Chicagoland is way, WAY too short to direct-sow either tomatoes or chiles. I planted mine indoors in late February, IIRC. They went in the ground the week of Mothers Day, and the tomatoes and the Poblano and Habanero chiles are now flowering. The Thai and Santaka chile plants are smaller, but they should be in flower by the 1st of July. But stranger things have happened - heck, my Thai seeds are from dried ripe chiles I bought at the Broadway Supermarket on Broadway last fall, and every seed I planted sprouted, which surprised me no end. For your sake, though, I hope we have a hot and rainy summer! Well, I had tried to start some seeds indoors, but there was a mishap involving my big dumb cat, Boris, that ended up with me scooping mud and seeds up off my living room floor at 2 a.m. So it was direct sow or bust (or limit myself to a few nursery seedlings at much higher cost). I currently have tomato sprouts about an inch high, and if I don't have tomatoes until September, that's fine by me. Otherwise I will just buy them at the farmer's market. Hi- You can still get tomato plants if you are not fussy about what you want. Yesterday one of the organic growers at the Evanston market had all her remaining tomato plants marked down to $1, I was going to get there at 7:30, because I knew that she had a few sungold left over from the week before, but I overslept, and I did not make it there until 10:00, and all her cherry tomatoes were all gone, but I ended up getting a plant that is supposed to produce tomatoes like crazy. I also got some plants for free at the plant swap on May 23rdat the Unitarian CHurch in Evanston, but they did not have any cherry tomatoes either. Thursday I went to Anton's, looking for sungold's, and of course they were out of them. I ended up spending a total of $6 on one huge black cherry plant, and a Juliet plant that actually had flowers on it. I got everything planted but the Juliet plant, because when I finally got around to planting that one yesterday, I had already spend over two hours in my garden. It felt like it was going to rain, but I persevered. When I spotted lightning, I finally threw in the towel, and it started raining just as I was loading up my car. It looks like it is dry enough now to maybe plant it. I spent a total of $7 on tomato plants this year, and I still have two more left that I got for free, that I really don't have room for, although I might make room for one of them. At the plant swap I also got all my sweet pepper plants for free too. Well, I went up to a friend's house in Wisconsin yesterday, and she sent me home with a carload of ferns and raspberry bushes for friends and the community garden, a bunch of daylilies for our yard, and a half-dozen small tomato seedlings. So if nothing else, I will have those. And my tomato seeds are sprouting all over the place; I guess we'll see how they do by the end of the summer! I am certainly going to have tons of summer squashes and cucumbers at the rate things are going, particularly squashes. And the mixed Mediterranean melon plants seem to be doing nicely so far. You're probably already planning on it but thinning is winning when it comes to your seedlings. Given the late start, you'll want to give them as much room to grow as possible. Oh, for sure, I am already trying to think of victim...err, recipients for the mixed summer squashes! I think every last seed in that damn packet germinated, and even though I gave away half the seed packet to a co-worker, they will all be duking it out for space within the week, I think. Maybe I will do like last year with the cherry tomatoes (they outgrew my back porch window boxes - I had to thin them out like 3 times!) and give seedlings away to my co-workers. Hi- You don't need more than two zucchini plants. That is enough to feed an army. About 50% of the time when I have planted zucchini though, they have been hit with squash vine borer, which usually kills the plant unless you dig them out of the vines early enough, which is hard to do. Your zucchini plant can look just fine one day, and three days later can be dead. The only solution I have found for squash vine borer is to plant one or two zucchini plants in May, and then plant another plant the middle or end of June. The vine borers usually show up in June, and will not return until the following year, and so a second planting is not affected by them. I have found out that it is difficult to get rid of zucchini. I did not realize how many zucchini haters there are. You also run into people that don't know what to do with them. Eh, I'm not too worried about it - I have lots of people to give away squash seedlings to (and they aren't all zucchini - it was a packet of mixed squash varieties). My co-workers are happy to take them - I just checked with our mailroom guy, who was a cherry tomato recipient last year and says he will take whatever I want to offlload. (He lives with his parents in a house in the burbs with a big garden.) And if it turns out to be a problem, I can just bring in squashes to my office of ~ 70 people. But let's make it through June first! Ha! I am not a squash fan but I admit to pillaging the blossoms off the plants which are expensive and hard to store--win/win!! I'll post some shots of the veg garden should it ever stop raining. 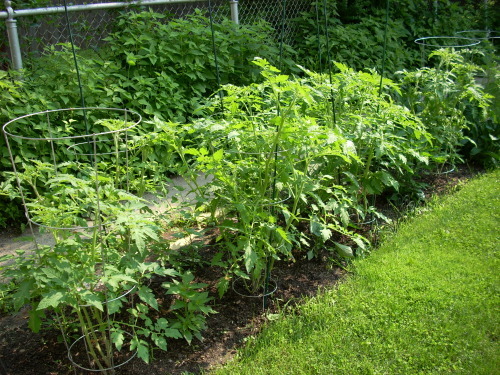 . .
sundevilpeg wrote: prune and mulch your tomato plants. Love to see this info but the link isn't working and I'm not sure what I'm looking for--if you could check it, that would be great!! Well, isn't that peculiar? Alternatively, click on my blog link at the bottom (no worries - I'm not trying to sell you anything). Thanks for the heads-up. First day of summer, Evanston: The tomato & chile garden. Good site & sunlight + proper bed prep in April + pruning and mulching = a big payoff in late July. 6/30/15 Update: It's amazing what nine days of solid Tomato Weather (and judicious pruning, round II) can do for your plants.They and the chiles have officially turned into a hedge. Also, the squashes continue to go insane. I know I should thin those out, too (beyond the half-dozen seedlings I gave away to co-workers), but I just can't bring myself to intentionally kill plants. I didn't thin out the radishes soon enough - we ended up with lots of greens, but not many radishes. Luckily, they made an awesome Bengali radish-green curry and a round of radish-green pesto. Next up: broccoli! I can just stir-fry whatever I thin out, right? Eva Luna: the best advice I can give you is to watch the video on tomato pruning by Gary Pilarchik. Really solid and concise - and watching someone do it is always helpful. For whatever reason, it just won't link here, so see my blog at the bottom. Find out if your tomatoes are determinate (which automatically stop growing at a genetically-determined height) or indeterminate (which just keep growing and growing and growing and - well, you get the idea! ), too. Rule of thumb: most heirloom tomatoes are indeterminate. Re transplanting: tomatoes are enthusiastic growers, so just dig up a good sized root ball, and plant all the way up to the first leaves. Water regularly, and with the current weather conditions, and decent soil, you should be fine. Go back and prune/mulch as Gary P. recommends to ensure plant health. Re the squash, speaking of plant health, keep in mind that thinning now means healthier and more vigorous plants going forward. It's for the best. And yep, broccoli thinnings are stir-fry fodder.